TechFed Nashville, in partnership with the Nashville Entrepreneur Center, presents a monthly Lunch & Learn Series designed to connect tech startups with experts in the local product development community. The Lunch & Learns feature leaders and doers in Nashville’s business, entrepreneurial, and tech ecosystem. Whether you are a software developer, designer, product manager, marketer, entrepreneur, or business leader, these seminars are designed to help you gain a deeper understanding of the best ways to design technical solutions for challenging business needs. Lunch & Learns are free and open to all members of the Nashville business and tech community. You do not need to be a member of the Nashville Entrepreneur Center to participate. Registration is FREE, and includes a light lunch courtesy of our sponsors, but seats are limited. You Built It, But Can You Sell It? with Chris Hefley, chief revenue officer at Retrium and co-founder and former CEO of LeanKit. GDPR: You’re Probably Breaking the Law with Tara Aaron, founding partner at the intellectual property and technology law firm of Aaron Sanders. Tara is a Certified Information Privacy Professional in U.S. Privacy Law and represents clients in Nashville and all over the world in trademark, copyright, technology licensing, and internet law. 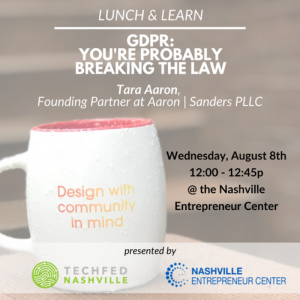 Aaron | Sanders Law is a frequent sponsor of local technology events, including TechFed Nashville, and Tara has spoken on IP and privacy issues in Nashville at PodCamp, Social Media Club, and the Entrepreneur Center, and as far away as Bangkok, Berlin and London. 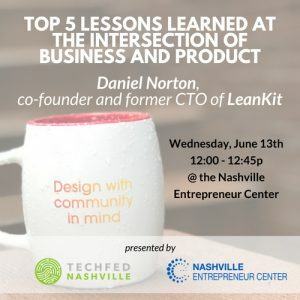 Top Five Lessons Learned: A Career at the Intersection of Business and Product with Daniel Norton, co-founder and former CTO of LeanKit. An accomplished software developer, technologist, and business leader, Daniel has a unique perspective and boundless enthusiasm to share from his experience. He is currently pursuing an MBA at MIT’s Sloan School of Business. This Lunch & Learn Series is organized by TechFed Speakers, an initiative of TechFed Nashville which helps connect organizations and events looking for presenters with a curated list of experienced speakers from the Middle Tennessee grassroots tech community.